LEMP (a server stack) stands for Linux, Nginx, MariaDB, and PHP. Nginx is a free, open-source, high-performance HTTP web server; known for its stability, rich feature set, simple configuration, and low resource consumption. 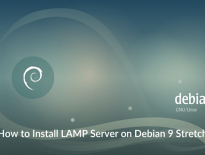 Here, we will talk about how to install LEMP Stack on Debian 9 with PHP support (via PHP-FPM) and MariaDB support. PHP-FPM is an alternative PHP FastCGI implementation, and it has a lot of additional features useful for websites of any size, especially busier sites. 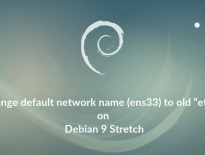 Here is the post about Step by Step installation of Debian 9 and Upgrading Debian 8 Jessie to Debian 9 Stretch. Proceed to the installation of AMP (Nginx version 1.12, PHP version 7, MariaDB version 10.2) on Debian 9. The first thing you need to do is to log in as root or switch to root user. Update the system repository index. First, we will install the MariaDB server by issuing the following command. Auto-start the MariaDB service during every boot. Type the following on terminal and hit enter. Download the Nginx repository signing key. Add the Nginx public key to the system. Append Nginx repository to /etc/apt/sources.list file. Install Nginx package using the following command. Start the Nginx service after the installation. Issue the following commands to allow HTTP and HTTPS requests through the firewall. Open a web browser and visit the below URL, you should see the following page; this will confirm you that the Nginx is successfully installed on the server. Nginx’s default document root on Debian 9 is /usr/share/nginx/html/. The configuration files are found under /etc/nginx/ directory. Auto-start Nginx at system startup. Install PHP through PHP-FPM (PHP-FastCGI Process Manager), an alternative PHP FastCGI implementation. It provides additional features useful for sites of any size, especially busier sites. Install php-fpm by issuing the following command. PHP-FPM listens on the socket /var/run/php7-fpm.sock by default. To make PHP-FPM use a TCP connection, open the file /etc/php/7.0/fpm/pool.d/www.conf. Create a virtual host configuration file /etc/nginx/conf.d/virtual.conf. Create a host entry for your domain (server.itzgeek.local) in the /etc/hosts file. Add host entry; the line should look like below. Create the root directory for the virtual host. For testing the PHP, place a PHP file onto the document root of the created virtual host. Save and close the file. Use Esc + ;wq for saving the file. Restart the services and enable them to start automatically on system startup. Open up your web browser and type your domain name in the web address. Ex.